I took these pictures at my dad's office but we didn't know of these problems until we started remodeling. 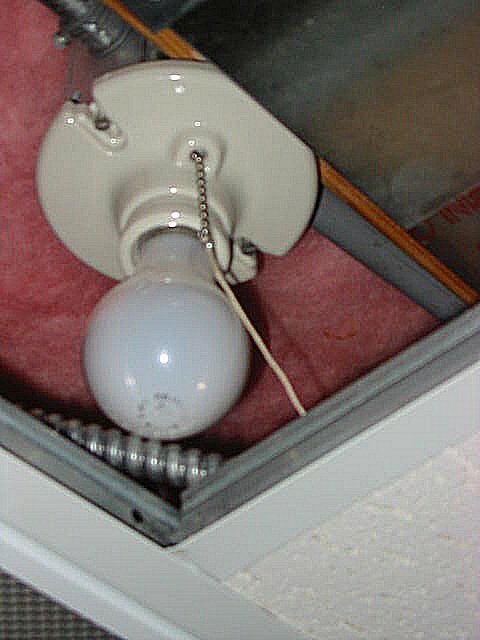 The picture with the pull-chain light is in a paneled ceiling attached to a single gang box and it turned on when I pulled the string. The genius that installed the circuits apparently didn’t believe in ground wires because only 6 out of about 60 circuits actually have a ground wire connected to the grounding bus bar. All of the other circuits coming have been grounded through the metal conduit runs. Is that a three phase panel with a lug missing? Is there an EGC even run into this panel? At least they installed switch duty breakers. The pull chain lamholder was probablt 'there first'; then the drop ceiling was installed. Continuous metalic conduit runs do not require a EGC. I love the wire nuts dangling outside the panel! Well, it could be a sub panel which is probably the case. That wouldn't require a main disconnect. I'm not crazy about that URD cable being used for the feeders though. No doubt that that "A" phase lug is burned off. Wonder what every third pole space is doing for power? Is it just me or does it look like that PVC coming in on the upper right has been reduced from 1-1/4" to 1"? Maybe the burned-out phase is the reason for the "X's" on all those breakers- they don't have one of their legs and thus don't work correctly. It is very unlikely that is a 3 phase panel. That insulator/support is the same on C-H "CH" type single or 3 phase panels. What's with the yellow grounded conductor? I've only seen yellow neutrals in marine-type flexible cable assemblies. 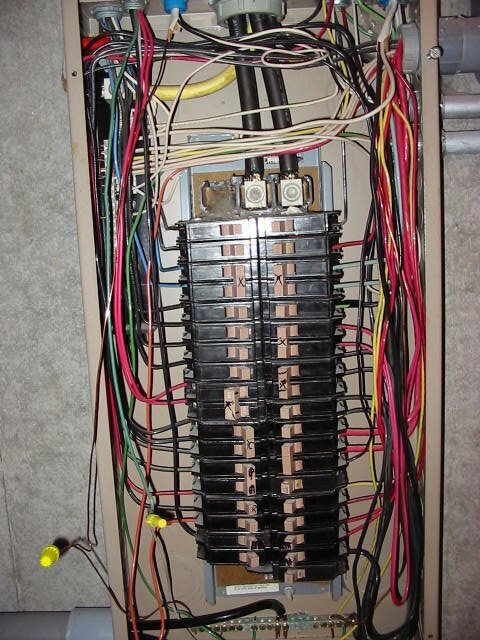 And if this isn't a main panel without the benefit of a main disconnect, can someone explain the bond between ground and neutral? Looks like quite a mess!